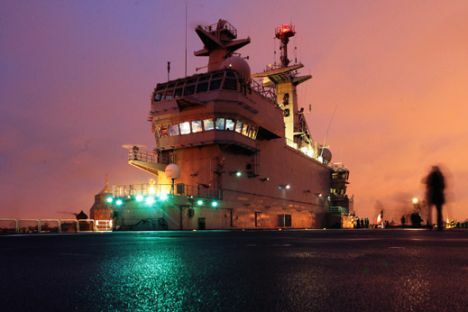 Negotiations between Russia and France on a refund to be paid for Mistral-class helicopter carriers are coming to an end, Russian President's Military-Technological Cooperation Aide Vladimir Kozhin has said. "Negotiations are almost over. The refund issue will be resolved soon," Kozhin told Interfax-AVN on Thursday. As reported earlier, the value of the contract for the construction of two helicopter carriers stood at 1.2 billion euro. France has been paid 840 million euro. Rosoboronexport and France's DCNS signed a contract to build two Mistral-class helicopter carriers in June 2011. St. Petersburg-based Baltiysky Zavod, part of the United Shipbuilding Corporation, built the sterns. The STX France Saint Nazaire shipyard attached the sterns to the bows and put the finishing touches to the ships. The delivery of the first helicopter carrier, the Vladivostok, to the Russian Navy was due in the middle of November 2014, but the French administration refused to honor its contractual commitments under the pressure from NATO allies, primarily the United States, using the escalating tensions in eastern Ukraine as an excuse. The second carrier, the Sevastopol, was supposed to be transferred to Russia in fall 2015.